The love triangle between Creep Squad President Peter Gunz, his wife Amina Buddafly and baby mama Tara Wallace, who’s currently pregnant with his ninth child, has been taking all types of twisted turns. Now, the “Love & Hip Hop: NY” star is opening up about it all. 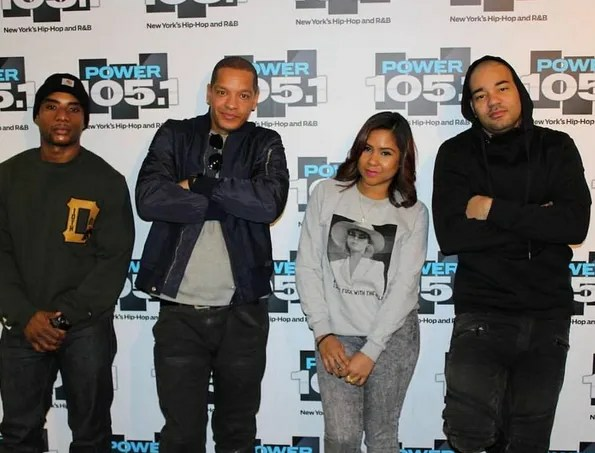 Peter dropped in on Power 105’s “The Breakfast Club” to address the rumors that have been circulating about his and his “sisterwives.” FYI—This interview was taped before the reunion show taping where Amina confirmed she was pregnant again by Peter, so no questions were asked about that. As you know, Tara is ready to give birth to Peter’s ninth baby. So what name have they picked out for their new bundle of joy? He said they are naming him Gunner. He went on to talk about how Tara’s family looks at him differently now after everything he has put her through. They no longer look at him the same way after seeing how he treats Tara on television. As far as his “creepish” ways, the former rapper pretty much owned up to all of his actions, but he said he did NOT purposely get her pregnant at the same time. HOW SWAY? You do realize how babies are made…especially being a father of 8. As for how/why Tara ended up moving into the same apartment complex as him and his wife, he said he likes to take his sons (by Tara) to school everyday, but the drive from Yonkers to Queens was starting to become a burden. He said both women agreed to it when he first presented the idea to them. So did Amina really get an abortion? He confirmed she did. So, those of you who thought she never got one, there you have it. While he is the father of 8 children (with two on the way), he said none of his baby mothers have him on child support and that none of his kids are on welfare. He did admit that his other babies mamas are embarrassed by his antics on the show. When asked if he’s worried about STDs he said “Umm, yea.” And confirmed he has never had any. Not sure we’re totally believing that one. He said doesn’t use condoms because he feels safe with the “home team.” Sighs…we just don’t understand why these grown women would rather be the first instead of the ONLY. With all of the drama going on, Peter said he’s never going to choose between Tara and Amina. He said he wants to stay married to Amina, but he’s not sure if it’s going to happen. He said the only way this love triangle is going to end is if one of them decide to leave him and he sort of hints that one them may have decided to call it quits, but he didn’t reveal who. Why he won’t just remain a single man and act as such is beyond us. But we’re sure selfishness has something to do with it. Then he started spilling the beans about an altercation that went down between two male castmates. Here’s what went down (according to Peter)…. His co-stars DJ Self, Rich Dollaz and Papoose all went to Peter’s restaurant (that he owns) to shoot a scene for the show. He said everything went well, it was just a typical night out with the fellas. As they were wrapping up and taking off their microphones all of a sudden a drink was thrown across the room and people starting yelling. He said Papoose threw a drink at DJ Self! Why? Well apparently because DJ Self wasn’t showing “love” to NYC. He said Self kept singing “Down In The DM” (by Down South rapper Yo Gotti) and it apparently ticked Pap off because he felt like Self wasn’t showing love to New York. He went on to say Pap doesn’t really drink, but he believes he was drinking that night so it could have been the liquor talking. We not see this altercation go down on the show because he said it was at the end of the season, so it probably won’t make it to the show. Damn Pap…what’s really good? Later, Peter talked about his son Cory Gunz (who is signed to Young Money) and his gun charge. He said Corey is good and is currently on probation while working on his music. He said superproducer Swizz Beatz has been working with him on some new tracks. Peter then went on to say no one can tell him anything bad about Cash Money/Young Money because they paid for his son’s lawyer and looks out for him. Hmmm…we’re sure there are a handful of artist who would disagree. I’m not buying the story that Amina had an abortion, No Sir !!!! lies for the show …..lies to one up Tara and scare Peter, she had to one up Tara again and get pregnant after Tara was pregnant….that’s a serious hussle for a paycheck ….. They all need help !